CORNELL WOOLRICH: A BIBLIOGRAPHY - Additions by Paul Herman & Steve Lewis. The first definitive bibliography of the novels and short stories of mystery author Cornell Woolrich was compiled by Francis M. Nevins, Jr., and it appeared at the end of Nevins’ mammoth work on Woolrich’s life, First You Dream, Then You Die (Mysterious Press, 1988). Readers of Mystery*File 43 may recall our telling you about the auction at the 2004 Windy City Pulp and Paperback Show. It was there that Paul was the winning bidder on several sets of file cards owned by Popular Publications, publishers of Dime Detective, Black Mask, and many other pulp magazines. 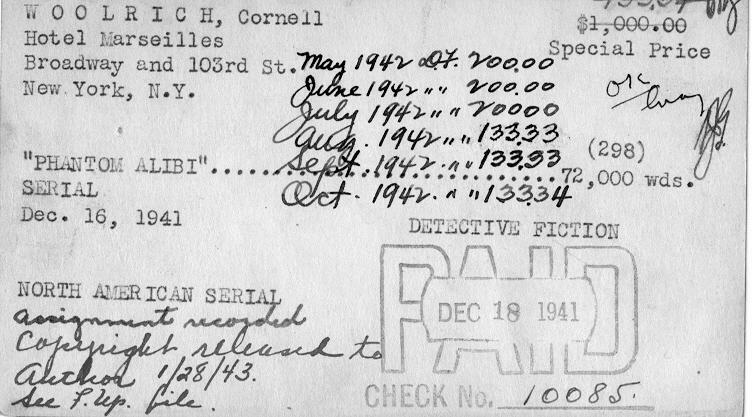 These file cards detail the various transactions Popular Publications had with all of their authors, including Cornell Woolrich. Not only that, when Popular bought out the Munsey line of pulps, the Munsey records came with the sale, which means that the stories Woolrich sold to Detective Fiction Weekly and Argosy, among others, were also recorded on these small piecess of history. There are no major finds among these cards – no previously undiscovered story under an unknown pseudonym, for example – but many of the stories were submitted by Woolrich under different titles, which we’ve recorded here. And on occasion, yes, he did indeed submit a story under a pen-name, although the publishers always decided to use Woolrich’s name instead, and rightly so. After all, we are certain that neither “Chick Walsh” or “Tex Brooks” would have had the eye-catching appeal of the real name of the prolific Cornell Woolrich. Besides the title changes, we’ve also included a handful of reprint appearances of some of the stories. None of this information was included by Mike Nevins in his original bibliography, although some of it may have been mentioned in the text. As you read through what follows, you might ask yourself which title you prefer, the original, or the one the story eventually appeared as, and see if you would have outvoted the publisher, if you had had the chance. 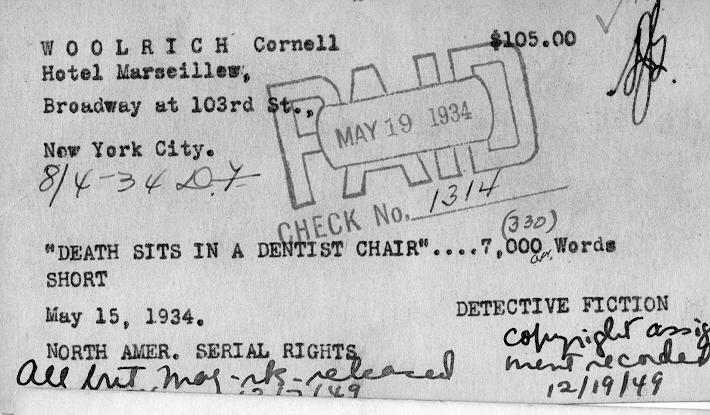 There is other information on these cards, by the way, in case a further researcher is interested, often including the number of words, and how much Woolrich was paid and when. On occasion, one can discover how much was paid to the typist who retyped a story when it was sold to be reprinted. Photos of several of the cards are included. In a way, it is surprising to know they even survived, but since many pulp collectors are fairly tenacious researchers as well, they fell fairly easily into good hands, and now into Paul’s. 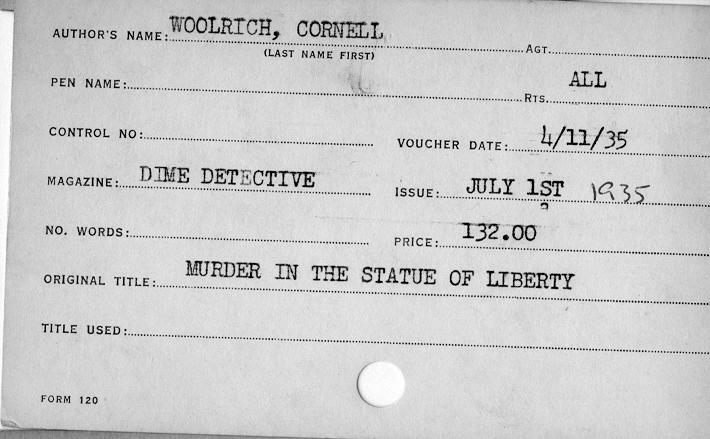 Note: This was Woolrich’s first appearance in Dime Detective. Note: This story was later expanded into the novel The Black Angel. Note: It is not so stated on the file card, but this story must be “Kiss of the Cobra” from that issue of DD. Reprinted in New Detective, 10-51. Note: The story has been reprinted under its original title. (*) Published as “Public Toothache Number One,” according to Nevins. Note: The story has been reprinted several times under its original title. Reprinted in Detective Tales, Apr 1951. Murder-Story Murder Story Det. Fiction Weekly, 9-11-37. Note: Submitted under the pen name “Chick Walsh.” This was the first issue of this magazine. Note: The story was reprinted once under its original title. Note: Pencilled in after “The Eye of Doom” is the notation “#1.” The overall novel was published in in four installments in serial form. #1. 13,005 words $240 on Feb 3, 1938. #2. 11,800 words $265 on June 9, 1938. #3. 13,201 words $265 on Sept 1, 1938. #3. 14,413 words $250 on Dec 1, 1938. All payments seem to have been made within two or three days after submission. The Miller Mattle — Dime Detective, no date stated. Note: At the bottom of the file card is the pencilled notation: “Eyes That Watch You” with a question mark. The story was reprinted once under that title. Note: This story was reprinted once under its original title. Death Makes a Personal Appearance — Dime Detective, 9- 40 ? Note: While not so stated on the file card, this story must be “Flowers from the Dead” from that issue of DD. Cocaine C-Jag Black Mask, 10-40. Note: This story was reprinted twice under its original title. Note: Reprinted in Black Mask, 1-51, under the new title. Note: The story (24,500 words) was accepted as a serial and has the notation “To be cut,” but it was published complete in the one issue. Most if not all of its reprint appearances have been under the original title. Notes: This story was later expanded into the novel Deadline at Dawn. Reprinted: Black Mask, Nov 1950. Notes: The story was submitted as 14,000 words; it is stated that 1000 words were cut. Reprinted: Detective Tales, Jan 1951, as “Dark Flight.” The file card for this second publication states the number of words as 14,300, with no mention of words being cut. Murder from a Fixed Viewpoint It Had to Be Murder Dime Detective, 2-42. Note: This story was reprinted at least once under its original title. The Case of the Orphaned Diamonds Orphan Ice Dime Detective, 9-42. Note: The file card entry is incorrect in attributing the publication of this story to Black Mask. Bequest Implacable Bequest Detective Tales, 9-42. The Body in Grant’s Tomb <same> Dime Detective, 1-43. 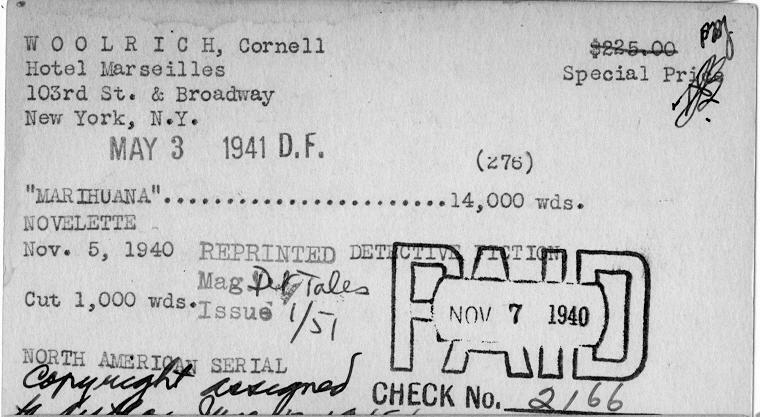 (*) Neither the new title nor the date of publication are included on the file card. (*) The new title is not included on the file card, only the magazine and date, with a question mark on the latter. Footnote #1. The original title was crossed out on the file card for it, which made it difficult to decipher, but Mike Nevins confirms that this is correct, as can be found on page 144 of First You Dream. It is his belief that the title is an address for a street in Paris. Footnote #2. Mike suggests that this should be “The Miller Matter” but “The Miller Mattle” is the title as it is on the card. There is no indication on the card as to the title it was changed to, but Mike says that almost certainly must be “The Case of the Talking Eyes,” Dime Detective, 9-39. The protagonist of the story is named Janet Miller. We would like to thank Mike Nevins for making various other corrections and suggesting some changes to the presentation. And of course without him, we would have needed to start from scratch. Mike has more to say about Cornell Woolrich in his own column. 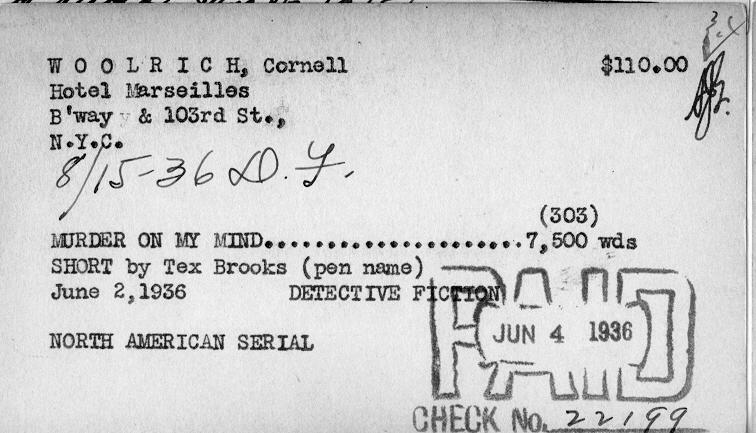 The file card for the the first pulp detective story written by Cornell Woolrich. 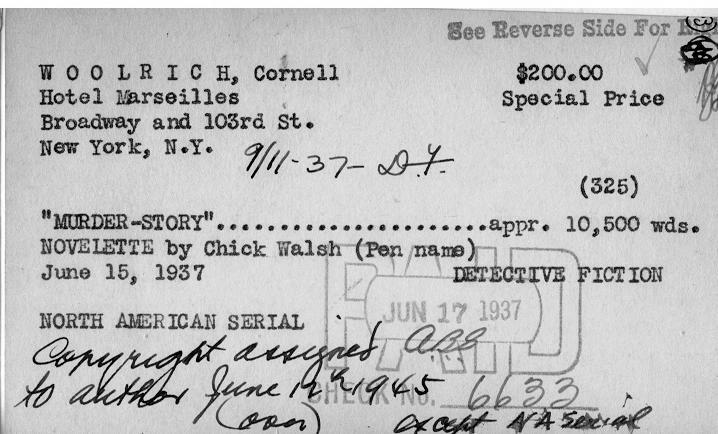 The card for one of the stories Woolrich submitted as Chick Walsh. The card for the serialized Phantom Alibi. The card for one the stories Woolrich submitted as by Tex Brooks.